When I teach my money unit, my students practice counting just one type of coin first. For example, once I feel they have mastered counting just nickels, then I add in some pennies. 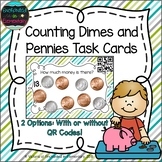 This is the one of the practice pages for counting dimes with some pennies. 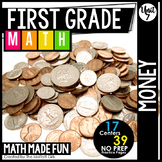 The sums of each group is under $1. Students pick up a dime or a penny as they land on a gameboard spot. Look out for the big, hungry wolf! He will take all of your money. Count your money when you reach the cottage. Students familiarize themselves with dimes and pennies while practicing counting on from 10. Great math station or math center activity. Comes with 2 piggy bank counting mats. 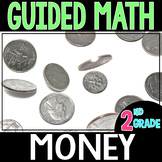 Simple worksheet where students count combinations of dimes and pennies. 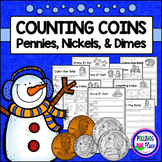 This packet includes 26 worksheet pages on counting coins. 7 pages on pennies, 6 pages on nickels, 6 pages on dimes, and 7 pages of mixed review. I have included an answer key which can be seen in the preview. 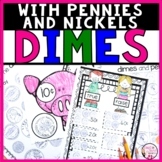 This is a matching game to help students count by 10’s (dimes) and 1’s (pennies). There are 3 sets of cards (red, blue, and green). Cut each set of cards (20 cards in each set) and follow the directions. 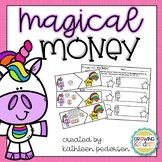 This is a basic worksheet to practice counting pennies, nickels, and dimes. There are 10 questions in which students count each row of coins and write the total in the box to the right. 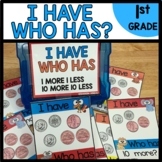 This can be used whole group, independently, or as a quiz/test.